Spot the deliberate mistake . . . I am rather agnostic about the need to plaster our TV screens with wall-to-wall GAA coverage. 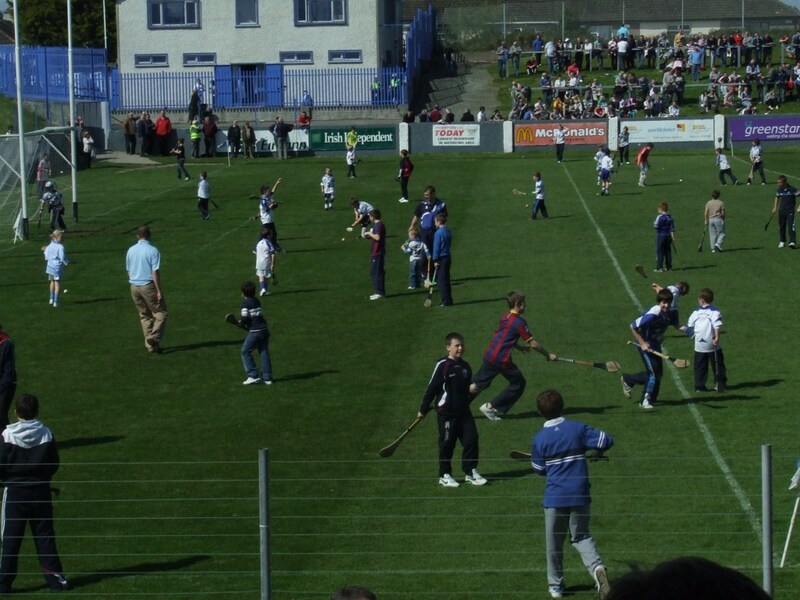 Quite apart from concerns about the effect on attendances – you could certainly understand people staying at home and watching it on the box rather than attending a match at a drizzly Thurles on a Saturday night – there’s a part of me that sees interaction with the GAA as a radio thing. It’s not just about Mícheál Ó Muircheartaigh – Mick Dunne was just as much a fixture. It was about hot summer Sundays, hang sangwidges on Kilfarrasy beach and listening to a provincial final on the wireless. 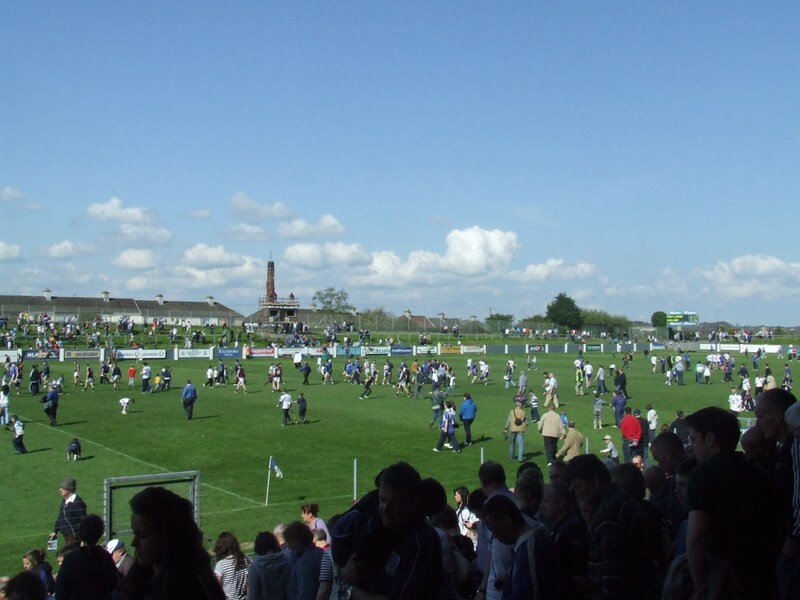 Ah, how such images get mingled with a blissfully happy childhood, because it certainly wasn’t anything Waterford were doing that evoke those happy memories. And even in the Twitter age, the radio has its uses. 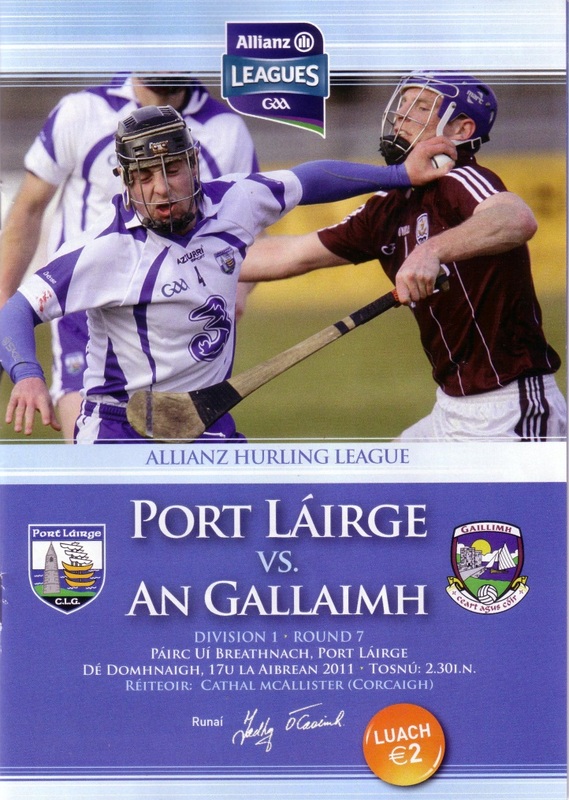 Could you rely on a feed from a Tipperary or Wexford supporter to find out what was going on in their game, one that was just as significant in terms of Waterford’s NHL fate as this one against Galway? No, for all of the well-documented gripes people have with RTÉ de transistor is the best way of keeping up with events around the country, and so it was that I came to the game with headphones dangling from my steam-powered, resolutely un-Twitterish mobile phone. Cue The Final Coutdown as we follow the final round of the 2011 edition of the National Hurling League in the company of Raidió Éireann. And I would learn pretty early on the value of listening to the radio, a lesson that needs to be understood by everyone reading this site – their match reports are courtesy of impartial journalists who are concentrating on the game as a whole rather than furiously contemplating just how Waterford were being screwed. The game opened with Pauric Mahony scoring after about ten seconds, something I missed as I hamfistedly tried to set the stopwatch on my phone. Galway soon responded, Johnny Coen getting the freedom of the park and teeing up Iarla Tannian for their first score. Mahony then dropped a ball short but Brian O’Sullivan, having being dealt lemons, decided to make lemonade and stroked over a fine score. Kevin Moran drew a foul and while Mahony seemed to lose the ball as he flicked it up he made the necessary adjustment to send the free over. Now it was Waterford’s turn to get the freedom of the park, O’Sullivan making some space for himself and putting Eoin McGrath clear on the right. But McGrath waited for the ball to come to him which allowed the Galway backs to get across. He felt the need to shoot on sight and the ball went wide. From the puckout Galway played one of many short puckouts, almost all of which worked out well for them, and this one was worked to Barry Daly who did all the hard work running through the Waterford backs only to shoot woefully wide. Daly followed this up by clattering Shane O’Sullivan. Cathal McAllister had clearly being reading this article on American website Slate which tells us just how well ‘ard hurlers are as he produced no yellow card and gave O’Sullivan little in the way of comfort as he lay on the floor. Never mind, our comfort was a point from Mahony which at that moment was announced by Brian Carthy on RTÉ, Waterford 0-4 to 0-0 ahead. Hang on a sec, I thought Galway had gotten a point. Obviously not, and as stated earlier the lesson is clear – don’t ever read this site expecting an accurate report. This will be even more true come the Championship where I am likely to dispense with the note-taking. The reports here are from the gut – feel free to make comparisons with Barry Goldwater. If you want a truly accurate report, that’s what newspapers are for. And speaking of accurate reports, it was time for the first update from Thurles. Tipp were 0-4 to 0-1 ahead. Ho hum, not much doing there. Galway were trying to get back in touch but Iarla Tannian hit it wide when he had more space than he thought to steady himself. At the other end, Johnny Coen was left exposed by a teammate and Kevin Moran poured through him only to hit his shot on the run wide. Galway finally got on the scoreboard, Joe Canning doing his own one-man stampede and was eventually given a free from which he pointed. Coen got in on the act with a great solo effort and his midfield colleague Daly was successful with a similar effort which went wide. Waterford’s left flank then collectively performed miracles to keep a ball in play only for Liam Lawlor to hold onto the ball giving Canning the chance to trim the gap to one point. When Galway were getting the ball they were gamboling away from like gazelles. The problem for them was they weren’t getting much ball. I like to assign this to the presence of one T Browne in the Waterford half-back line, but whatever it was Waterford were on top in the possession stakes and were soon back on the front foot, pouncing on some loose play by Galway after a super piece of fielding by Adrian Cullinane to get the ball to Shane Walsh who got his first score of what would be another productive day’s work. One of the great pleasures of being to so many League matches this year has been watching Walsh blossom into a bona fide inter-county hurler and he immediately followed that by teeing up Brian O’Sullivan who, after treating the ball like a bar of soap, got it to Shane O’Sullivan to slot it over the bar. The other Shane has not had it so good and was unlucky to be penalised in the next attack. There was nothing unlucky about the free which came from the free, Jerome Maher using his marker as a stepladder, and Canning stroked over the free. Casey did have a happier moment soon after, intercepting a loose pass only to mis-hit his shot which bobbled into the vicinity of John Grealish in the Galway goal. He took his eye off the ball though and to much mirth deflected the ball out for a 65 – had he been in front of his goal rather than to the left of it . . . and Mahony couldn’t even take the minimum punishment for such a blunder, sending the dead ball wide. Waterford continued to dominate possession, but suggestions that this wasn’t the most robust Waterford attack did not seem to be far wide (sorry) of the mark, Waterford failing to take advantage of a splendidly purposeful series of passes down the right flank when Seamus Prendergast, on as a blood sub, shooting wide from a ridiculously narrow angle when he had enough time and space to find a better spot. Shane Casey took a more orthodox route to goal, putting the head down and charging through the middle, and managed to draw the free from which Mahony restored Waterford’s three point lead. Another attempt to do that after he had won Tony Browne’s clearance came up against the immovable object of Tony Óg Regan who cleared the danger. 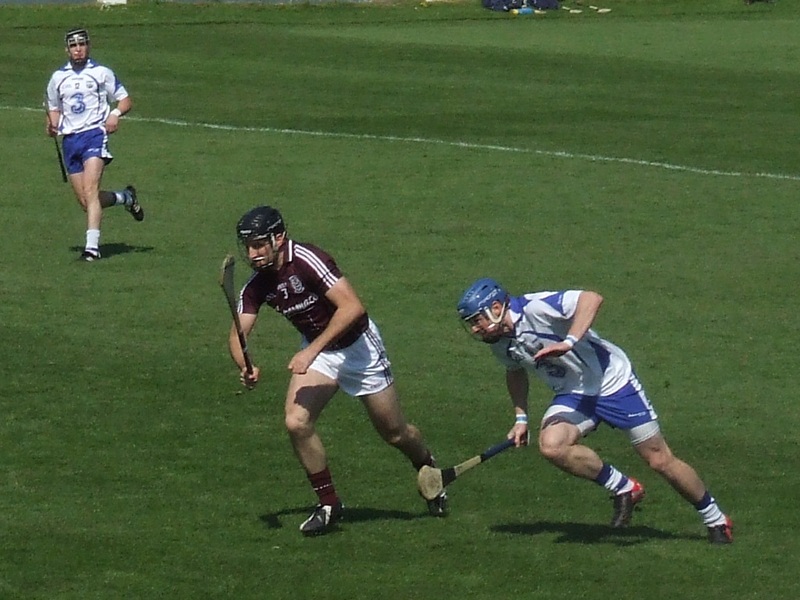 Not having shipped any hammer blows despite Waterford’s best efforts, Galway landed a flurry of shot. Iarla Tannian scored a corking point on the run, then turned and pivoted from a free-out to reduce the gap to one. Inbetween those scores Waterford were a trifle unlucky, Casey getting clear on the right and his ball across came to Prendergast who genuinely fell on the ball but the ref decided to give a free out. Damien Hayes then got lots of space to level matters for the first time in the game. We needed some scores, or at the very least knock them back on their heels and who better than Shane Walsh. He hit a wide when he might have done better than got into a goal-scoring position on the right only for this attempt to bat the ball into the net to be blocked out for a 65 which Mahony sent wide. At the other end Galway over-elaboratedon an attack which karma dictated had to go wide. Eoin McGrath won the ball well but his attempt to flick the ball over his head to Shane O’Sullivan was a bit too cute for O’Sullivan who couldn’t keep the ball in play. Kevin Moran then won the ball brilliantly and got a foul, the free from which drifted frustratingly wide from Browne. The wide count was beginning to pile up, Shane Casey adding another one when trying to shoot while falling over, so thank goodness for that man Walsh – it really is a measure of his increasing stature that you’d not necessarily assume I meant Michael – who won the ball, stepped away from his marker with breathtaking ease and slotted the ball over the bar to leave Waterford in front at half-time. The break featured an outrageous display of pitch encroachment that will surely cost the association thousands in claims. Averting my eyes from the carnage on the pothole-strewn surface, I endeavoured to find out what was happening in Thurles. My initial assumption about that I’d spend more time paying attention to that was stymied by RTÉ’s insistence on devoting more time to the game I was watching than all the others put together. In retrospect, this made sense. If Galway won then all the other games in terms of the team going to meet Kilkenny in the final would be irrelevant. And the Tipperary – Wexford game was following a depressingly familiar pattern with the home team edging five points clear. The only question would be who’d get the bullyboy hat-trick in the last ten minutes as they sent Wexford down with a flourish. The second half started as the first had ended, Shane Walsh getting a good point. 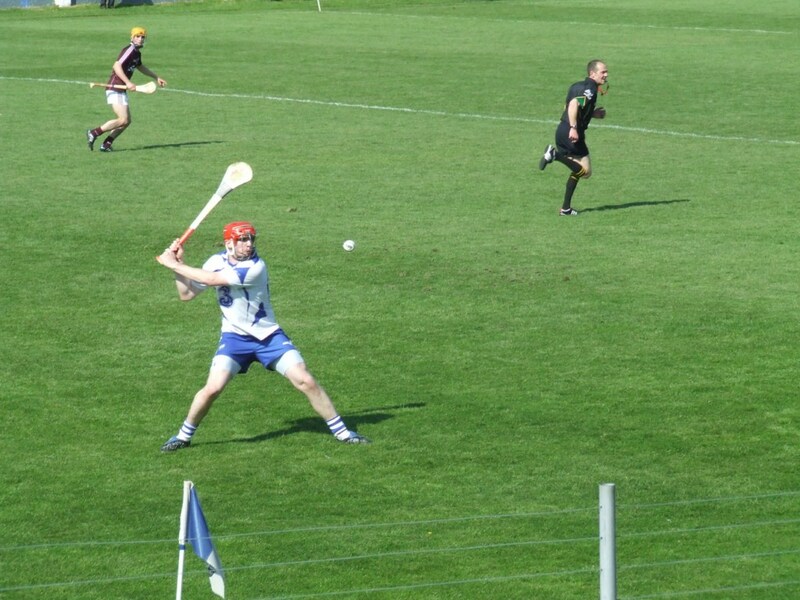 He continued to wreak havoc although a ball to Brian O’Sullivan gave him no chance to do anything positive with it. Barry Daly got a point that was typical of Galway’s day, a fine individual effort on the run. 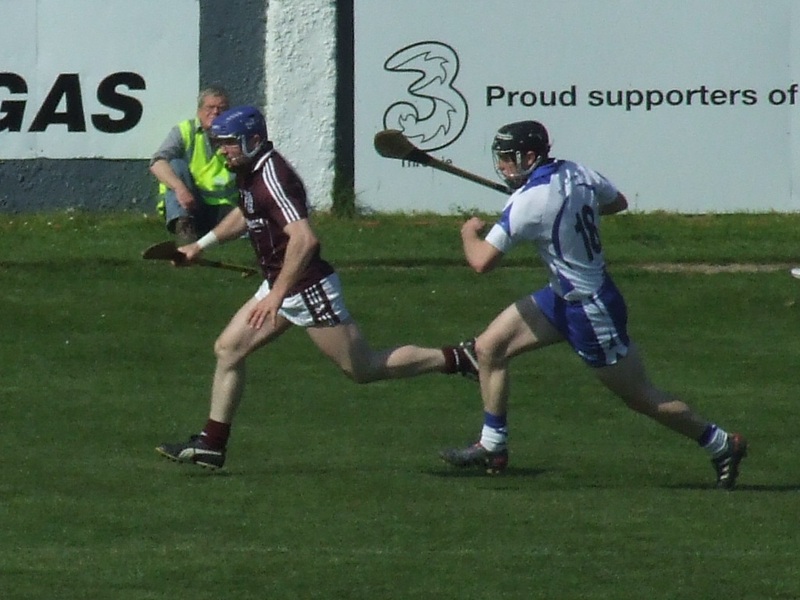 Waterford then had an untypical moment (on the day anyway) in defence, Clinton Hennessy’s short puckout – every one Waterford tried on the day led to a squeaky bum moment – was intercepted and rifled straight back over the bar to level the scores for the second time. It was a ghastly moment, but it was soon forgotten as Waterford suddenly went nap. There was no surprise that Shane Walsh was at the heart of it, his bulldozing run ending with what this time was a successful bat to the net, but it was a lovely move which gave him the opportunity, pinpoint handpassing and speedy movement unlocking the Galway defence. And that was only half of the story as Waterford rattled off another three points without reply. Pauric Mahony sent over a free off the post from way out on the left, Walsh galloped down the middle and coolly slotted over another, then Waterford almost got in for a goal, Gavin Crotty losing control of the ball as he bore down on goal, but hwe had the wit to get the ball back to Brain O’Sullivan on his shoulder who put Waterford six points clear. It was stirring stuff, and at that moment news came through that Tipperary were a mere three points ahead against Wexford. Could the impossible happen? Suddenly I realised that a result for Wexford was a necessary but not sufficient condition for us to reach the League final – we’d need Cork to beat Dublin as well. It was tight in that game, but the burst of excellence from Waterford had left me in such a tizz that I could barely focus on who was ahead. Maybe Waterford got into a tizz as well. More likely it’s a function of the iron law of hurling which states that you can only put in that much effort for so long before a closely-matched opponent comes back at you. Whatever it was, Galway came back into the game, helped psychologically, by a nasty bit of messing around in the Waterford back division. Each pass back got them deeper in trouble and when Clinton Hennessy flubbed it Iaral Tannian pounced. 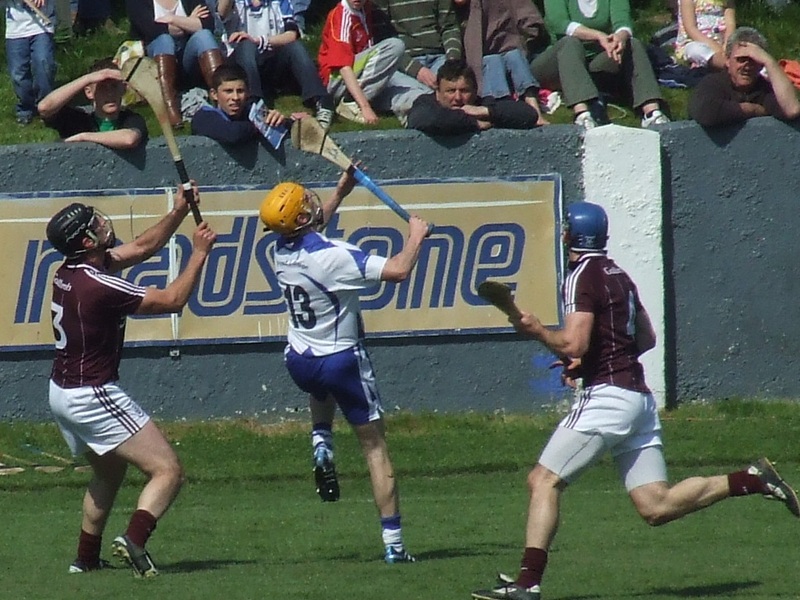 Except he didn’t, Hennessy managing to get a despairing flick to the ball which gave the rest of the Waterford backs time to get back and crowd it out, Joe Canning’s shot eventually being charged down. It hadn’t yielded a score, but this was just the fillip Galway needed and they responded accordingly, Damien Hayes scoring a point on the run then, just as news came through that Wexford were still within a score of Tipp, Joe Canning did what he does best. He took a clearance on the 45, spun on a sixpence, strode towards goal with the grace of Apollo and arrowed an unstoppable shot from distance past Hennessy. It was magnificent, and sometimes there’s consolation in knowing there’s nothing to be done about it. Enough objectivity. Let’s be grateful for balls hitting the ref when Galway wee on the attack and soft frees out after Tony Browne had managed to wriggle out of a tight spot where there wasn’t room to perspire. Let’s be grateful from a gravity-defying intercept from Kevin Moran and a subsequent free-in from which Mahony steadied the ship. And let us offer gratitude for inept play by the opposition, Damien Hayes hitting a terrible wide from the centre of the goal after Niall Healy had done the hard bit, a miss that brought waves of anger from the levelheaded Galwayman sitting beside me – lucky he was too occupied with this hyperactive son to see my cruel smirk. Shane Casey then won the ball clean and gave Kevin Moran a scoring opportunity which he took to put Waterford four points clear. Moran then gave that back by running into trouble after he had cleared up after Eamonn Murphy had run into trouble. Galway’s free from Moran’s overcarrying found its way to Healy to make it a one score game again. Any shape had completely gone from the game at this stage, both teams flinging the ball into the mix with abandon. Waterford got another free from which Mahony scored only for Canning to immediately rub that out by gathering a sideline ball and effortlessly taking his point. Tipperary still three points up at this stage, the lead changing hands with seeming abandon in Páirc Uí Chaoimh. An extremely open period of play culminated in a wide from Mahony that had the crowd whooping as if it had gone over the bar. Tsk. A long period of injury time followed which was surely going to be significant at the end. Clinton Hennessy then put Liam Lawlor into a lot of bother with a handpass which ended in a free-in for overcarrying and the lead reduced to two. With the game as fluid as it was, it felt like Galway would need a goal as Waterford were managing to tack on points at frequent enough intervals, Mahony getting another from a free after Crotty’s hurley had been held. Could we stop them scoring a goal? It wouldn’t matter if Galway got scores like Tony Óg Regan’s free from the Hypermarket, a monster score after Shane Casey had been penalised for throwing the ball. Tipp were four points up but with this game so delicately poised it made sense for RTÉ to linger with it. Eamonn Murphy shot wide after some good approach work, then Barry Daly channeled the spirit of earlier on in the game with a fine point on the run. Waterford were fortunate to get the ball clear after faffing around in the box but managed to get it up to Shane Walsh who brought a collective intake of breath from the crowd as they waited to see what he’d do – Galway managed to push him out far enough that he could only squeeze it wide. A throw-in after a clash ball led to an oooh from the crowd but the ref wasn’t interested and the ball eventually went out for a sideline ball. After another stoppage Galway got the ball to Joe Canning who smacked the ball over the bar and the teams were level for the third time. It was all down now to which team wanted to win it more. No, scratch that ráiméis, it was down to which team would get some dumb luck before the ref decided to call time. And, as it happened, it was all Waterford. Shane Casey earned a softish free – hmm, seems to have been a lot of that running through this report – under the stand and Mahony arced a splendid effort over the bar from a long way out on the wrong side for a right-handed free taker. The board had gone up for ‘at least two minutes’ which was a surprise given the long delay earlier in the half. Philip Mahony won the puckout and fed Shane Casey whose shot brought more bird-brained cheering from fans who don’t live by the wise idea of waiting for the umpire to signal before celebrating as Casey’s shot dropped short. Galway went on the attack and their right wing-back was sent flying as he came down the sideline. Even given the potential for more injury time than the two minutes, Galway would probably still have need a goal so it was sensibly dropped in where it was batted away for a Waterford back to hit a daisycutter that brought the final whistle for a rather stirring victory, ending a run of six straight defeats to ‘An Gallaimh’ in the League. Moments before the whistle came the scarcely-believable news that Wexford were leading against the All-Ireland champions so RTÉ switched straight over to Cork to see how Dublin were getting on – not quite as memorable as the time they switched to Seville when the Republic of Ireland had drawn with Northern Ireland in the 1994 World Cup qualifiers to see how the Spain – Denmark game was going, but the principle was the same. Dublin duly clung on for a famous victory and our ambitions towards reaching the League final were finally extinguished, but you couldn’t say that we hadn’t given it a lash. Having chopped and changed the team seemingly without pattern it was nigh on miraculous that we’d won four of our seven games, two of those wins by the absolute minimum. This win was certainly the most satisfying of the four. 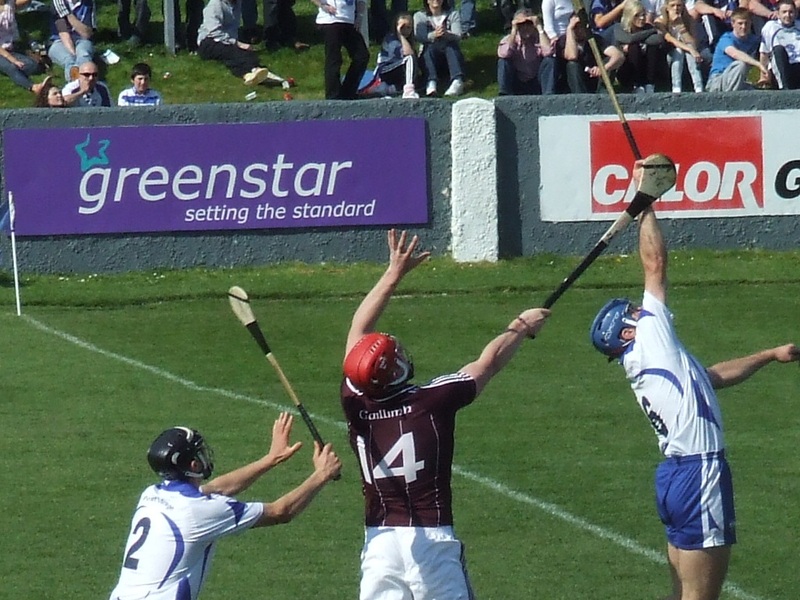 The margin of victory did not reflect how much more purposeful Waterford had been, Galway’s ordinarily free-scoring attack made to look ordinary by a marvellously scrappy back division. Up front Shane Walsh seems to be getting better with every game and with John Mullane and Stephen Molumphy to come back . . . okay, it doesn’t sound like an All-Ireland winning recipe. But we’ll be competitive, and that is ultimately all we can ever ask. 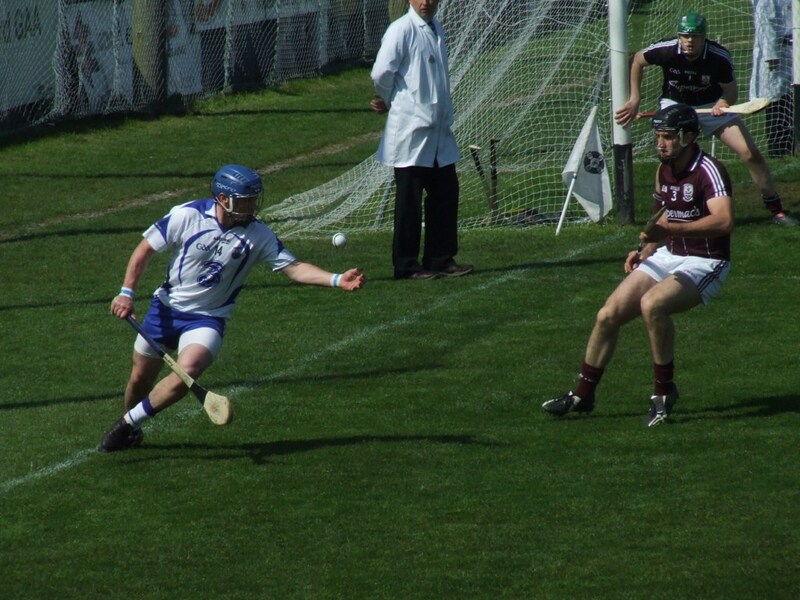 This entry was posted in Hurling, Match Reports, National League, Waterford and tagged Galway on 18/04/2011 by deiseach. didn’t realise it was 6 straight defeats!